The oriental massages at Het Massagehuys help you to relax, to energize, to get a sense of well-being and to purify your body. With every massage we made a special 100% natural massage oil and chose an organic herbal infusion that both reinforce the effect of the massage. These make your treatment complete. In case you have specific physical symptoms that we should now, we kindly ask you to inform the masseur before your massage. We offer a special Pregnancy Massage for pregnant women. 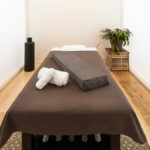 A massage takes approximately 55 minutes and costs € 65 including the massage oil and a complimentary pot of organic tea. The Authenthic Asian is the classic, oriental massage, as it is passed on for centuries from generation to generation. It makes use of the same pressure points as Asian medicine. This reduces stress and gives the life energy the opportunity to move freely. She’s Special is a salutary moment of indulgence. A moment for yourself, away from the hustle of city life. This massage include a foot massage and facial massage, and together with our Oil of Treasures and French Lavender infusion makes a moment of well-being, especially for her. Stuck shoulders, back pain or other typical office symptoms? The Strong Muscle is an intensely deep sports massage that aims to loosen knots in your muscles and massages deep tissue. It is a ‘no pain no gain’ massage, so it is just by biting to get rid of your symptoms. The corresponding Tigerpower Oil provides deep warmth and tingling freshness for overworked muscles. The Stress Relief provides ultimate relaxation of body and mind. Surrender to the professional touch of our masseurs and finally come to rest. For the best effect we use in this massage our homemade Huile d’Avignon, which is not only very good for your skin, but also brings you into total relaxation. 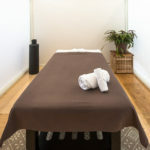 Our Deep Detox massage purifies your body and reinforces the self-cleaning system of your body. In a Deep Detox massage the masseur will massage towards your lymph nodes, which are in your neck, armpits, abdomen and groin. The corresponding Detox Oil helps your liver and kidneys to process toxins quickly. Our Pregnancy massage is a relaxing massage for you and your baby. The massage concentrates on your neck and shoulders, which are charged extra during pregnancy. But of course we also pay attention to the other parts of your body. The matching Huile d’Avignon relaxes and is especially suitable for pregnant women.